A subtly sweet and savory autumn side dish! Kabocha, or Japanese pumpkin, is a sweet variety of winter squash that reaches its peak during fall. The exterior looks like a green squatty pumpkin, while the inside is a deep yellow-orange color. After the autumn harvest, kabocha is an essential part of celebrating the winter solstice in Japan. According to We Love Japanese Food, traditional Japanese folklore states that eating kabocha with red bean soup (shiruko) on the winter solstice will prevent common colds. This isn’t very surprising, given that kabocha is high in cold-fighting vitamins A, B1, B2 and C, along with immune-strengthening minerals like calcium, kalium, and iron. It’s also a great source of dietary fiber and protein for prolonging digestion and controlling blood sugar. Once harvested, kabocha takes 1.5 to 3 months to fully ripen, making it the perfect vegetable to store for the long winter months. Where did kabocha squash originate? Much to my surprise, it was domesticated in America. In fact, all squash was. Crazy, right? I had no idea. So, how the heck did it become a Japanese staple? Well, like most American-origin vegetation, migration occurred after the Spanish took it back to Europe. From there it traveled east around the globe, and in 1541, during the Azuchi-Momoyama period, kabocha arrived in Japan via the Portuguese by way of Cambodia. Although kabocha squash is a particular type of squash in North America, in Japan, it’s used as a more general term for most varieties of winter squash. 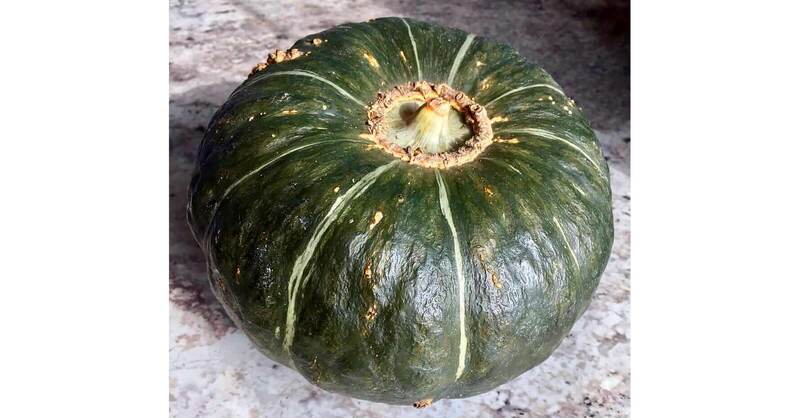 The green squatty pumpkin variety we are familiar with is called kuri kabocha. The taste is noted as being similar to sweet potato, and it’s often paired with chestnuts, as both autumn vegetables have a moist, fluffy texture. Other notable Japanese kabocha are miyako kabocha and bocchan kabocha. How do I break this squatty pumpkin open, you ask? First and foremost, be sure you have a sharp chef’s knife. The outer skin can be tough and will require some strength in your cutting arm. After rinsing and drying the squash, cut it in half. Then use a spoon to scoop out the seeds and stringy bits in the center. 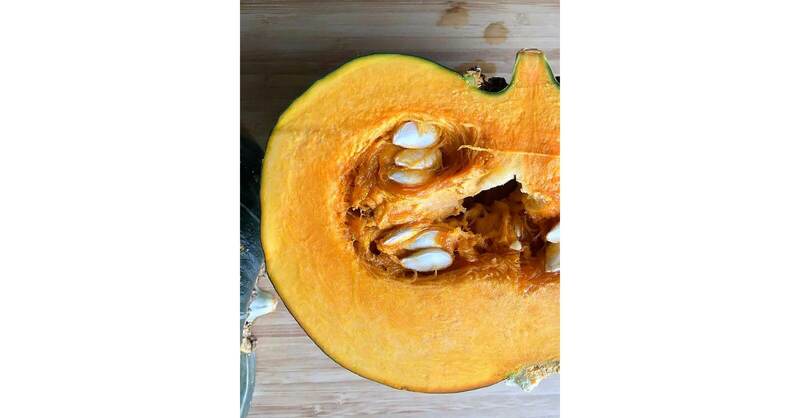 For pictures and informative squash dissecting tips, check out this article by Vegan Miam. 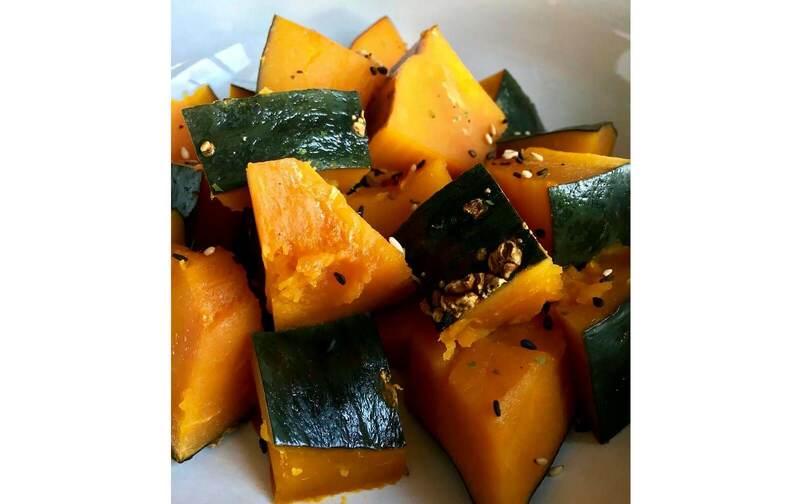 Kabocha is a versatile vegetable that can be roasted, stewed, seared, mashed, used as a main dish, or made into dessert. However, an autumn and winter favorite in Japan is Kabocha no Nimono, or simmered kabocha. Kabocha is simmered slowly in a savory broth, balancing the natural sweetness of the vegetable. It may be a rather simple dish, but it’s not short on flavor, and will be a delicious addition to your autumn and winter celebrations. Rinse and dry kabocha. Using a chef knife, cut kabocha in half, and remove the seeds and stringy pieces with a spoon. You may leave the green skin on the squash, as it softens with heat, but make sure to cut off the woody stems. Continue to cut kabocha into 1.5 inch pieces, roughly the same size so that they cook evenly. In a medium saucepan, combine water, tamari, sugar, sake, and mirin. Heat on medium, and stir until the sugar dissolves. 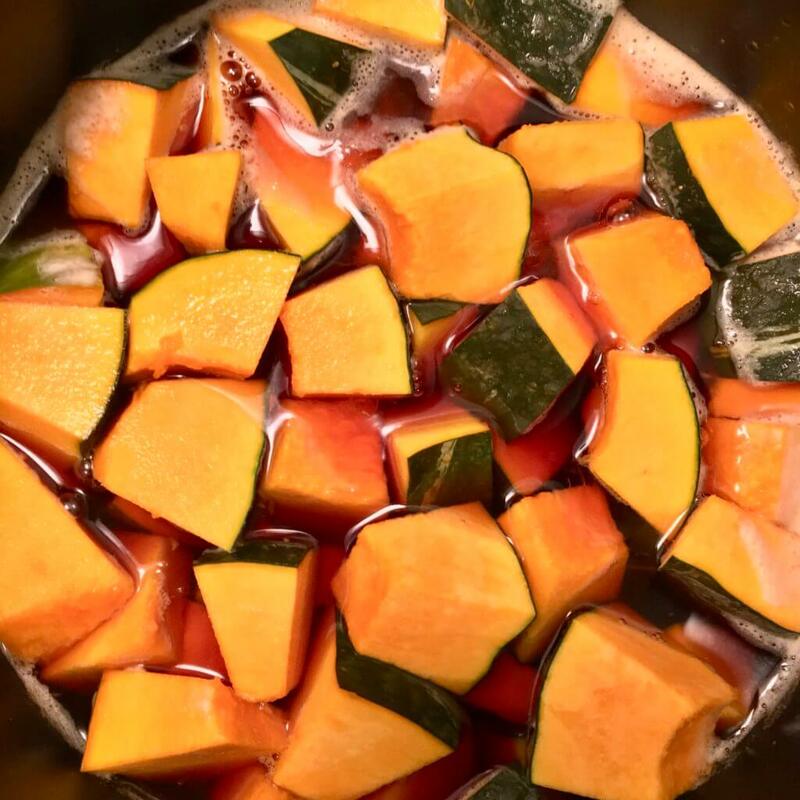 Add the pieces of kabocha to the stock. 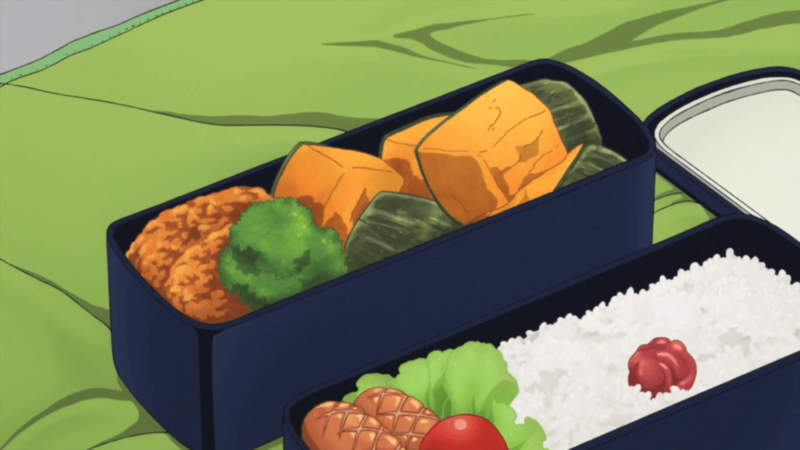 Note that the stock doesn’t cover the kabocha completely. Partially cover the saucepan with a lid, allowing some of the steam to escape. Some lids have a steam valve, but for those that don’t, just prop the lid open a bit. Sweet Contemplation suggests using a traditional otoshibuta, which can be purchased or made following these directions. Bring the stock to a boil. Immediately turn the heat down to low, and allow the kabocha to simmer until it is easily pierced with a fork (about 10-15 minutes). The dish can be served promptly, or allow the squash to cool down in the stock for maximum flavor. Just remember to reheat before serving. Store leftovers in the refrigerator for 3-4 days. *If needing more or less stock, keep the ratio as 100 mL water to 1 Tbsp. of each ingredient. Love this recipe? Please check out our other Yatta-Tachi Noms recipes!